I am sure, you’ve heard enough about it, but did you understand what really happened? Dieser Eintrag wurde veröffentlicht in Moving Image am Februar 27, 2009 von coderama. I didn’t know about Katamari Damacy till now. Dieser Eintrag wurde veröffentlicht in Moving Image am November 8, 2005 von coderama. Sehr schön, hier CNET’s TV.com (seit 13.6.05), entstanden aus dem kollaborativen TV Tome. Und weil das nicht allen passt, gibts seit 27. Juli TV IV Wiki. Dieser Eintrag wurde veröffentlicht in Moving Image am September 22, 2005 von coderama. According to Stefanie Olsen from CNET, Google is expected to reveil it’s new video search engine for Web-only video within the next two months. Google’s planned service will let visitors find free short-form videos such as the popular „Star Wars“ video spoofs, according to sources who asked to remain anonymous. The engine will complement the search giant’s existing experimental site that lets people search the closed-caption text of television shows from PBS and CNN, among others, and preview accompanying still images. The new capabilities will let people watch roughly 10 seconds of Web video clips for free before shuttling visitors to the video’s host site, sources say. […] Longer term, Google is preparing a payment system for a premium video service that would let people pay to watch full video clips. Google is talking to several top-tier content providers, including Hollywood movie studios, to gain agreements for aggregating their video and selling premium or pay-per-view access. […] Google has already forged an alliance with former Vice President Al Gore to provide search features for his interactive television project, Current.tv, a 24-hour network with viewer-contributed broadcasts that range in length from 15 seconds to 5 minutes. The project is similar to Google’s upload program, but for television. Dieser Eintrag wurde veröffentlicht in Moving Image am Juni 14, 2005 von coderama. En lisant JS tout récemment, je me suis souvenu du prochain festival international du cinéma documentaire à Nyon et le projet Reprocessing Reality. Dieser Eintrag wurde veröffentlicht in Moving Image am April 7, 2005 von coderama. Google comes up with a Video Search. Example : matches for the word „condom“ in the Desperate Housewives Pilot. Dieser Eintrag wurde veröffentlicht in Moving Image am Januar 26, 2005 von coderama. Would Barthes agree, if I say it’s a punctum? No I guess not. It is simply too salient, too saillant. 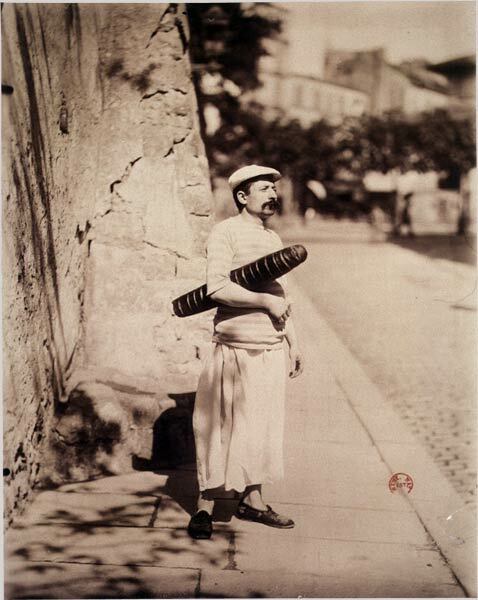 It could possibly be a punctum if I would look at this photo at the time it was taken by Eugène Atget (around 1900). But today this suitcase for a bread is simply too incongruent. But is it a suitcase… probably not. It’s just a well-baked baguette. So then we can reconsider it as a punctum. Ainsi le détail qui m’intéresse n’est pas, ou du moins n’est pas rigoureusement, intentionnel, et probablement ne faut-il pas qu’il le soit ; il se trouve dans le champ de la chose photographiée comme un supplément à la fois inévitable et gracieux; il n’atteste pas obligatoirement l’art du photographe; il dit seulement que le photographe a été là […] Qu’il soit cerné ou non, c’est un supplément : c’est ce que j’ajoute à la photo et qui cependant y est déjà. Dieser Eintrag wurde veröffentlicht in Moving Image am Januar 24, 2005 von coderama.